The metric system is the standard system of measurement in most of the world. It is used in the United States, but it is not the standard system of measurement there. The metric system uses a series of base units for measurements of length, area, volume, capacity and mass and weight, using prefixes to indicate measurements larger or smaller than the base unit. The metric system units of measurement for length are based on the meter measurement, which is nearly 40 inches in the American system. The abbreviation for meter is "m." The kilometer is expressed as "km," the hectometer as "hm," the dekameter as "dam," the decimeter as "dm," the centimeter as "cm," the millimeter as "mm" and the micrometer as "µm." The metric measurements for mass and weight are based on the gram, which is about 0.035 of an ounce in the American system. The gram's abbreviation is "g." The metric ton is expressed as "t," the kilogram as "kg," the hectogram as "hg," the dekagram as "dag," the decigram as "dg," the centigram as "cg," the milligram as "mg" and the microgram as "µg." 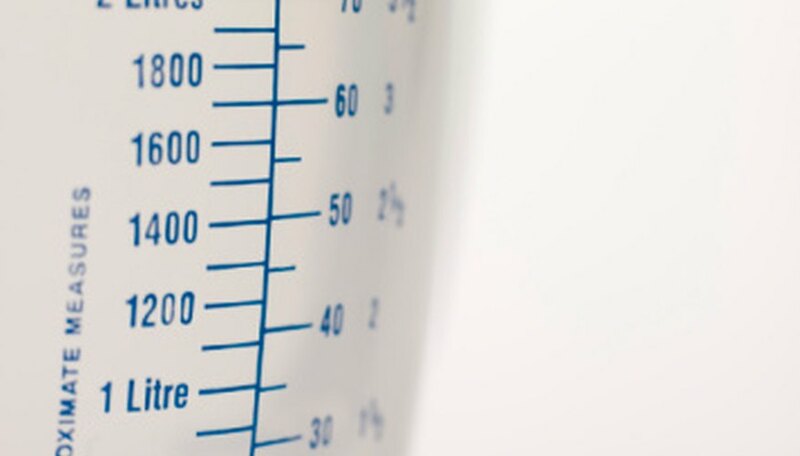 The base measurement in the metric system for capacity is the liter, which is equal to 61.02 cubic inches, or 0.908 quart for dry material and 1.057 quarts for a wet material in the American system. The liter's abbreviation is "l." The kiloliter is expressed as "kl," the hectoliter as "hl," the dekaliter as "dal," the cubic decimeter as "dm3," the deciliter as "dl," the centiliter as "cl" and the milliliter as "ml." Area and volume do not have as many units of measurements as length, capacity and mass and weight. For area, the square kilometer is abbreviated "sq km" or "km2" and totals 1,000,000 square meters, which is 0.3861 miles in the American system. Also, for area, the hectare is expressed as "ha" and the square centimeter as "sq cm" or "cm2." For volume, the cubic meter, which is equal to 1 cubic meter or 1.307 cubic yards, is expressed as "m3," the cubic decimeter as "dm3" and the cubic centimeter as "cm3," "cu," "cm" or "cc." Gresham, Tom. "Metric System Abbreviations." Sciencing, https://sciencing.com/metric-system-abbreviations-8536269.html. 24 April 2017.